It was just seven months ago that we decided to get a dog. My wife had just read the runaway best seller, Marley & Me, and she decided that we needed a dog to complete our family. I was convinced that only a big dog would work – and it had to be smart. 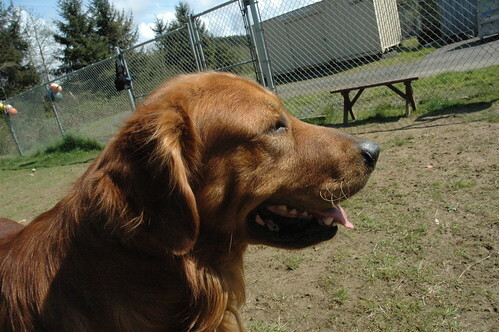 Glory be, we found a the perfect dog online at the Clatsop County Animal Shelter and because we were quick, we were first in line for him. Within a few days, and two trips to Warrenton, we came home with Raleigh. 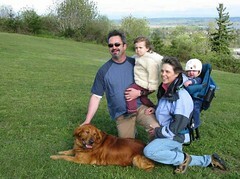 He was perfect – like most Golden Retrievers, kind, friendly, and loved our kids. Fast forward seven-months and it brings us to today. Removing a member of the family is never an easy decision. Granted, a dog doesn’t quite pull the same weight as a human member, but after several months, we had become quite attached to Raleigh. But, I think we’ve known for some time that this realtionship wasn’t going to work out. First, the biggest problem. Our Darling Daughter just wasn’t bonding with the dog. Well, not only was she not bonding, she hated him. From her perspective, just a 1/2 inch over three-feet and under 30 pounds, this 100 pound, four-legged bundle of joy was just too much to handle. Although Raleigh loves people, his love too much for her. Second, while we were taking steps to correct it, Raleigh was aggressive to other dogs. It really wasn’t fun to walk him or take him out. Not only did he have to stay on a leash, but he had to stay on a short leash. We read Cesar Millan’s book and we were following his instruction to help him be less aggressive, but he wasn’t getting the biggest treatment – more exercise. That is mostly my fault. Finally, in the last couple of weeks as we were trying to make up our mind, our poor ignorant dog began pulling recycling out of the bins, chewing it, and spreading it far and wide. I tried to explain to him that he wasn’t helping his case, but the chewing seemed to get worse and worse. On the way into town the other day, I asked our Darling Daughter if we should keep Raleigh. She said no. I asked her if she’d be sad. Again, no. Too bad The Wife didn’t feel the same way. As we talked it over though, we knew it was the right choice. Fortunately, when I delivered Raleigh back to the Clatsop County Shelter, Deputy Steve was very supportive. He kept telling me over and over that we were making the right choice. Not only is it not good for our Darling Daughter to be traumatized with a lifetime of dog-phobia (no, that isn’t the medical term), but it wasn’t worth traumatizing the dog and teaching him to dislike children. The deputy’s reassurance was very helpful. 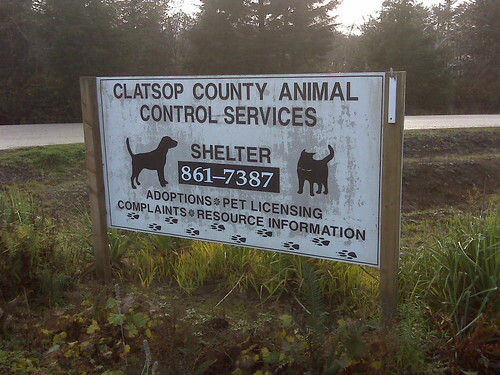 This shelter has a high-placement record and they do a great job of screening those who want to adopt animals. On top of it all, Golden Retrievers get snatched up quickly. There were five other people in line behind us when we got Raleigh. I know he’ll get adopted soon. It was a hard choice, and one we didn’t want to make. I’m pretty sure I won’t judge others so harshly in the future, when they make a difficult and very personal choice like this. So today, after seven months of friendship and several weeks of wrestling with difficult choices, I drove Raleigh back to the shelter. May you find a loving home with lots of room to run my dear friend. We’ll miss you. I’m sorry this didn’t work out. It’s always sad news when a pet just doesn’t mesh with a family despite hard work and best intentions. I remember when my family brought our lab-springer spaniel mix home the first day … and she ate half an apple pie off the counter in the first 15 minutes. If you’re thinking of looking for another canine friend, I might recommend @thepixieproject, which I recently discovered on Twitter. Bummer about Raleigh, but completely understandable. You definitely did the right thing. Ouch! That makes me VERY sad for you and for Raleigh. But if life was easy…. well, I’m sorry to hear that. Those are VERY tough decisions to make.